The Litter Box: Hello December, Hello Short Hair! 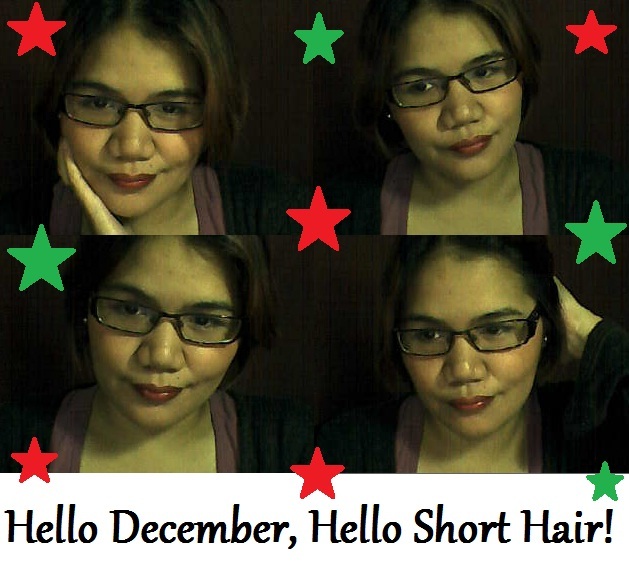 Hello December, Hello Short Hair! This is probably my shortest blog entry ever but what the heck?! December has begun and because I have clearly been declaring how hot it is each day, I have decided to chop most of my hair off. That's right. You heard me. From my wavy locks that flowed until my arms, I have decided to have them cropped until my neck. Now, don't look so aghast. I know that it is probably too short but then again, it is time for a change. Many people were surprised when they saw me. Some of them didn't approve of it but most of them understood and praised me for how brave I was to try something new. Personally, I still feel weird without long hair. I still look for it at times. Clearly, I am still getting used to it. I am glad though that I don't feel as hot anymore. Now, I can save a lot of time trying to fix my hair before I go out somewhere. I clearly don't need to use a lot of hair products anymore which is both less time and money consuming. So, here's my way of saying hello to December. A new hairstyle as I try to hope for a better 2013. I can't wait! So, how do I look? This isn't really my first time to have uber short hair. I remember having it done once or twice before but that was a long time ago. Now that I am older, I think I am more comfortable with it than I was. What do you think? Haha! You are not alone on that one. Everyone said the same thing. Not a big problem though. She is my Mom anyway and she has shorter hair than that.